A software engineer who bought a gun and silencer online is facing a five year minimum jail sentence after taking delivery of a fake parcel. David Mitchell ordered the firearm and 150 rounds of ammunition but ended up signing for a package mocked up to look like the original after US Homeland Security intervened. The High Court in Edinburgh heard that a Homeland Security special agent intercepted the original parcel at Newark airport in New Jersey on September 17 this year which was addressed to Pitreavie Court in Dunfermline. It was found to contain an amplifier but hidden inside the item was a fully operational Glock semi-automatic handgun similar to those used by law enforcement agencies, a sound suppressor and bullets. Advocate depute Liam Ewing said that following the find a joint operation was set up between Police Scotland and the National Crime Agency to create a package containing metal and wood to mock up the original. 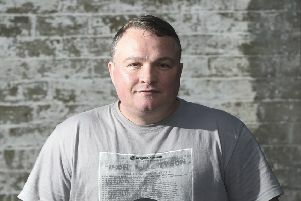 Mitchell was put under surveillance and a cardboard box containing the placebo was delivered to his workplace in Dunfermline. The mocked up package was discovered under the chair and the amplifier and packaging were in a recycling box. The prosecutor said that Mitchell “appeared distant” and was staring into space. He said that he suffered from depression and took medication for the condition. Mr Ewing said officers were concerned about Mitchell’s mental health and arranged a medical examination. A psychiatrist confirmed that he was fit to be interviewed. The pistol, silencer and bullets were sent to Scotland to be examined by ballistics experts. The gun was found to be in working order but the silencer was not suitable for use with the Glock. Mr Ewing said he had removed details of how the purchase was made from the narration for the court. It is understood the gun was ordered via the ‘dark web’. The judge, Lord Pentland, deferred sentence on Mitchell until next month for the preparation of a background report. He was remanded in custody. Defence solicitor advocate Ewen Roy said a psychiatric assessment of Mitchell has been instructed.